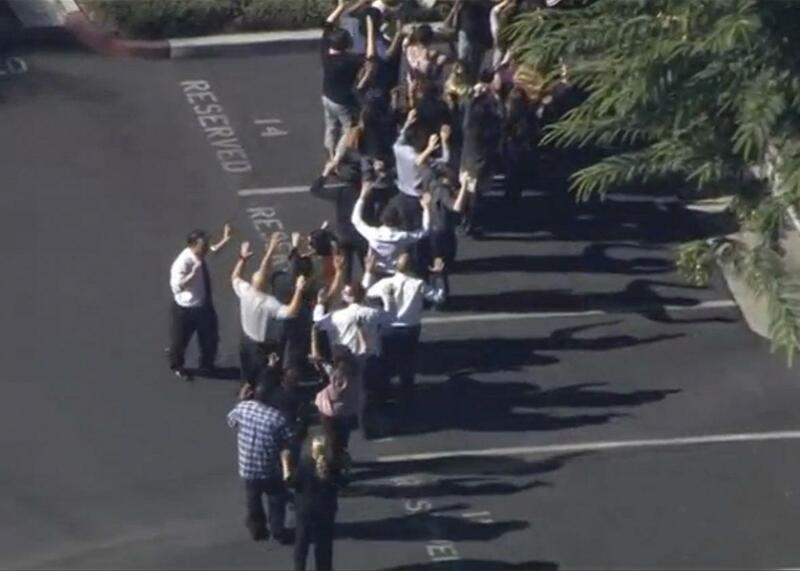 A still image from video footage shows people lining up as first responders respond to the shooting at the California Department of Developmental Services Inland Regional Center, which serves people with developmental disabilities, in San Bernardino, California, Dec. 2, 2015. The only reason you have not been shot is because nobody has yet decided to shoot you. Our patchwork of mostly loose state gun laws, combined with weak federal standards, ensures that anybody who wants a firearm can obtain one. Once acquired, this gun can easily be used to put a bullet in your body, maybe killing you, maybe paralyzing you for life. Perhaps you will be shot for a specific reason—by an abusive spouse, for instance—or at random in one of America’s increasingly common mass shootings. We live with this reality because easy access to firearms is, we are told, a vital aspect of American liberty. This was the National Rifle Association’s mantra throughout its decades-long push to block or topple gun control laws. This was the Supreme Court’s rationale in declaring gun ownership an individual right protected by the Second and 14th Amendments. This is the response of the pro-gun crowd following every mass shooting, as conservatives take to social media to defend untrammeled gun access without offering any realistic solutions to gun violence. If constant gun massacres are an inevitable result of American liberty—if we cannot be truly free without letting every madman, abuser, and hothead with a grudge get guns, if we cannot send our children to school without fearing they may be slaughtered in a hail of bullets—we need to reconsider what liberty truly means. The balance of which I speak is the balance struck by this country, having regard to what history teaches are the traditions from which it developed as well as the traditions from which it broke. That tradition is a living thing. In evaluating an asserted right to be free from particular gun-control regulations, liberty is on both sides of the equation. Guns may be useful for self-defense, as well as for hunting and sport, but they also have a unique potential to facilitate death and destruction and thereby to destabilize ordered liberty. Your interest in keeping and bearing a certain firearm may diminish my interest in being and feeling safe from armed violence. And while granting you the right to own a handgun might make you safer on any given day—assuming the handgun’s marginal contribution to self-defense outweighs its marginal contribution to the risk of accident, suicide, and criminal mischief—it may make you and the community you live in less safe overall, owing to the increased number of handguns in circulation. There have been at least 351 mass shootings so far this year. Mothers, daughters, brothers, fathers, sisters, husbands, and wives are being slaughtered every day by guns. Their blood is being shed in the name of liberty. It may be, as so many conservative commentators imply, that we cannot stop this horrific violence without infringing on others’ right to bear arms. But for the sake of these victims, and the future thousands upon thousands who will die the same way, we must at least ask: Is this trade-off worth it? As a country, we have adopted, then rejected other rights that we temporarily deemed fundamental. Infamously, the Supreme Court enforced a “liberty to contract” in the early 20th century, striking down minimum wage and maximum hour laws. Throughout this period, the court maintained that such regulations interfered with “the right of contract between the employer and employees,” depriving workers of the liberty to labor for brutal hours and minimum pay in toxic working conditions. So the justices tossed out health and safety laws, wage and hour laws, even child labor laws. Allowing children to work in dark, dangerous mines for pennies—and, of course, no health insurance to cover their inevitable coal-induced maladies—was seen as an American value. In those days, child labor was the price we paid for liberty. But America grew, and learned, and changed its mind. Today, we view that kind of cruel, hazardous labor as barbaric. And yet, at the same time, we are trapped in our own toxic infatuation with a new “liberty”: The liberty of anyone, anywhere, to access a gun. Many conservatives, and most Republican legislators, want us to believe that this liberty is an age-old one, as fundamental to American ideals of autonomy as freedom of speech. It is not. It is newly invented, firmly rejected by the Supreme Court until 2008, alien to our traditions and jurisprudence. Let us assume, though, that private gun ownership may be an aspect of constitutional liberty. In that case, we must balance “respect for the liberty of the individual” against “the demands on the organized society.” On one side of this equation, we have America today, which is what gun advocates have wanted all along: A freewheeling, disjointed legal framework which ultimately allows virtually anyone to access a gun. It has produced a greater number of mass shootings than this country has ever seen. On the other side, we have the possibility of fewer mass shootings and fewer gun deaths. We could make that possibility a reality, but we could only do so by limiting access to firearms. Gun advocates insist that the trade-off isn’t worth it—that endless mass shootings may simply be the price we pay for liberty. Now the country must decide: Is this liberty worth its cost in human lives?